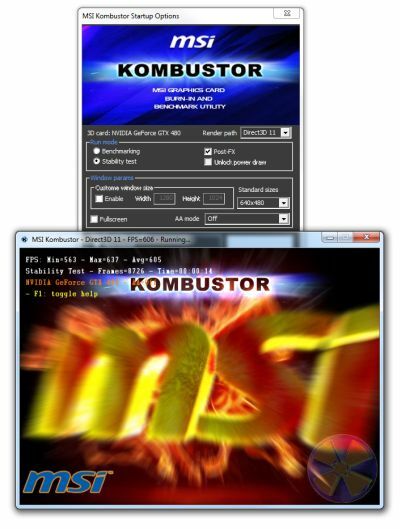 A new update of Kombustor, MSI’s VGA stress test based on FurMark, is available. Now, all versions of Kombustor (DX9, DX10 and DX11) are packed into a single Win32 installer. A loader (KLoaderWin32.exe) is called first and, according to the Windows version, starts the right version of Kombustor. Kombustor 1.1.3 thread on Guru3D forums can be found HERE. The D3D11 render path seems to have some problems to stress the GPU (see this thread). I hope it’s in my code… More on this asap. But DX9, GL2 and GL3 render paths are heavy! Change: a loader (KLoader) is now used to start the correct version of Kombustor (DX9, DX10 or DX11) according to the version of Windows (XP, Vista or Seven). Change: minor change in the refresh rate settings of DX10 and DX11 render window. Bugfix: added dim checking and resizing for custom textures.